An unfortunate and potentially dangerous part of the radio control flying hobby is that of disorientation, whereby the pilot becomes confused with exactly what his/her rc airplane (or aircraft) is doing, and which direction it's headed. If you're new to the hobby, you might be thinking "How can the pilot not know which way his plane is flying?? " but believe me, it's very easy to become disoriented and it's something that can happen to beginners and experts alike. So what exactly is rc airplane disorientation? It's a horrible situation that rc pilots can get in to, and if not corrected can result in complete loss of control of the plane. Disorientation occurs when the pilot loses his or her accurate visual reference to the plane, in terms of its trajectory and which way up the plane is. When disoriented, the pilot does not know if the airplane is flying away from him, or towards him, is climbing or is descending. The airplane becomes a silhouette to the pilot, with no clear indication of it's exact situation in the sky. If you look at the left hand image below, you'll see a plane flying away and turning to the right. But look at the silhouette on the right hand side, which is exactly the same image - what do you see? A plane flying away and turning to the right, or a plane coming towards you and turning to the left and in a slight nose-down attitude? Congratulations, you've just become disoriented! Above: a silhouetted plane can quickly disorient the pilot. In this particular example, you know that you're flying your plane away from you and that it's in a gentle right turn. But in a moment of complete disorientation, your brain suddenly tells you that the plane is turning to the left, and coming towards you. Yikes! As a natural reaction to what your brain is seeing and telling you, and in a moment of blind panic, you put the plane in to a steeper right turn to get it away from you. In reality, the plane is already turning right, and so the turn suddenly gets tighter, causing you even more panic. That is true rc airplane disorientation! What causes RC airplane disorientation? Rarely does an rc pilot become disoriented through complete stupidity - but that can happen! It's more common for disorientation to occur through no real fault of the pilot, but by the pilot just getting the plane in to a certain situation when flying normally and sensibly. Flying your rc airplane too far away from you is a great way to become disoriented. The further away it gets, the smaller it becomes and the harder it gets for you, the pilot, to see what it's doing. This is especially true for the 'ultra micro' size rc airplanes, but applies to any size. Flying in bad light, for example at dusk. Flying a plane that's a similar colour to the sky eg a blue plane against a blue sky, a grey plane against a cloudy sky etc. Flying your plane directly over your head, from front to back. This last one is really nasty, and I have seen an rc airplane crash in to a car (putting a hole in the front fender of the car) because the pilot became so disorientated when he flew directly over his head. Luckily nobody was injured. It happens in this situation because as the plane flies over you, you must look directly upwards and turn your head at the same time. All visual reference to the ground and surrounding objects is lost momentarily, and the resulting disorientation is almost inevitable. So the trick is to never fly over your head in the first place! Flying our rc airplanes in bad light isn't always avoidable, as conditions can change during a flying session. But going out to start a session just as the sun is setting, now that's asking for trouble. But with that said, modern LED lighting on planes has made night-flying a reality - just don't try flying in low light levels without an illuminated plane! Well, not doing any of the above is the obvious thing to say here, but it's inevitable that certain situations that cause, or at least contribute towards, rc airplane disorientation can happen when we're flying. If they didn't, then disorientation wouldn't be a problem for us! So aside from the "don't do that..." answer, what else can we do to help prevent it happen? Trying to be consciously aware of what the plane is doing at all times might sound like an obvious thing to say, but it's important. It's very easy to fly an rc plane with your brain on autopilot, but do try and think consciously about the plane's attitude, altitude, distance away from you etc. all the time you're flying. By doing so, you'll be less likely to suddenly find yourself getting caught out and wondering what your plane is doing. The bigger trick to help prevent rc airplane disorientation is sensible colour schemes for your plane. Use different colours for top and bottom surfaces, and use contrasting colours where you can. Or if you do want all your plane to be one colour, at the very least have a simple pattern on one of the wing surfaces - either top or bottom. 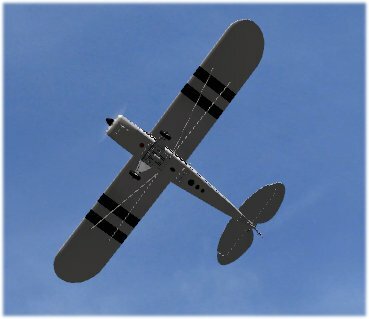 Just by putting a single or double stripe on the underside of the wings, for example, will help enormously with letting you know exactly which way up (or down) the plane is. The use of contrasting colours is important. If you have a boringly white foamie, put a dark colour stripe on it. There's not much sense in putting a pale yellow stripe on a white background. No rc pilot is ever immune from becoming disoriented, but by following the tips outlined above, you can cut the chances of rc airplane disorientation happening to you. Even by just be being aware of the issue is a good start. If you do become disoriented while flying your plane (and it happens in a split second! ), keep calm. It's a horrible panicky feeling when it does happen, but you need to keep a cool head and get through it. Wrong stick inputs at the wrong moment can be disastrous, and if you think that your plane is doing something that it isn't, or you think that it's not doing something that it actually is, a bad situation can be made much worse by applying the wrong control surface movement in panic. Just take a second or two to assess the situation. Cut the power and gently move a stick to see how the plane responds. By doing this, you should quickly be able to return normal visual reference. Keep rc airplane disorientation in mind all the time when you fly, and you'll be better prepared for when it happens. And I do mean "when", and not "if"!